GMA-7 shows topped the TV ratings charts on both daytime and primetime, during the last weeks of 2014. 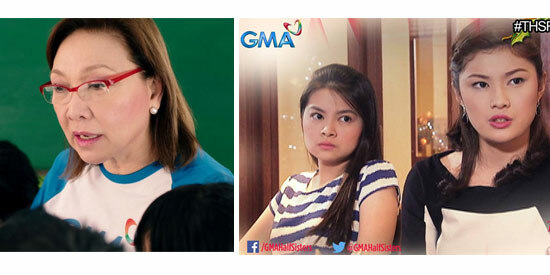 24 Oras, anchored by Mel Tiangco (left), emerged as the most-watched primetime show on most days while The Half Sisters starring Barbie Forteza and Thea Tolentino (right frame) often landed as the No. 1 most-watched daytime show. GMA-7 ended 2014 on top of the TV ratings charts. This is according to the latest ratings data from AGB Nielsen Philippines from Mega Manila households between December 15 to 31, 2014. GMA-7’s shows topped the TV ratings charts on both daytime and primetime, on the last weeks of 2014. The most-watched show on daytime was still The Half Sisters, an afternoon drama that stars Barbie Forteza and Thea Tolentino. Other Kapuso shows such as Eat Bulaga! and Yagit follow The Half Sisters. On weekday primetime, the most-watched show was 24 Oras, GMA-7’s primetime newscast anchored by Mike Enriquez, Mel Tiangco and Vicky Morales. The only exceptions were ABS-CBN’s Dream Dad (top 1 on December 19) and Hiram na Alaala (top 1 on December 23). ABS-CBN’s primetime programs performed well on the week before Christmas, December 15-19. Kapamilya shows like Dream Dad, Forevermore and Two Wives were able to get better ratings than their Kapuso counterparts. But GMA-7’s primetime dramas outperformed these Kapamilya offerings on the following week. For instance, 24 Oras, Strawberry Lane, More Than Words and Hiram na Alaala formed the top four primetime shows on December 30. GMA-7 also dominated the weekends with its shows Magpakailanman, Kapuso Mo, Jessica Soho and Kapuso Movie Festival. GMA-7’s talent search Bet ng Bayan aired its finale episode on December 28 with 14.3% rating, lower than the 16% rating received by ABS-CBN’s Gandang Gabi Vice.